You’re going to fall in love this tres leches cake- I did! It’s tender, moist and sweet, the perfect treat for your Cinco de Mayo fiesta!! It’s been forever since I’ve made & eaten tres leches. I’m talking upwards of 10 years!! Back in high school I was enrolled in a culinary arts “program” and for the month of May we had a Cinco de Mayo fiesta where we made all sorts of traditional Mexican dishes. The tres leches cake was my least favorite. I found it soggy, eggy, bland and overly sweet. How do you feel about it? Everyone I know has always raved about it, so I set out to make one that would please my toughest critic- myself! 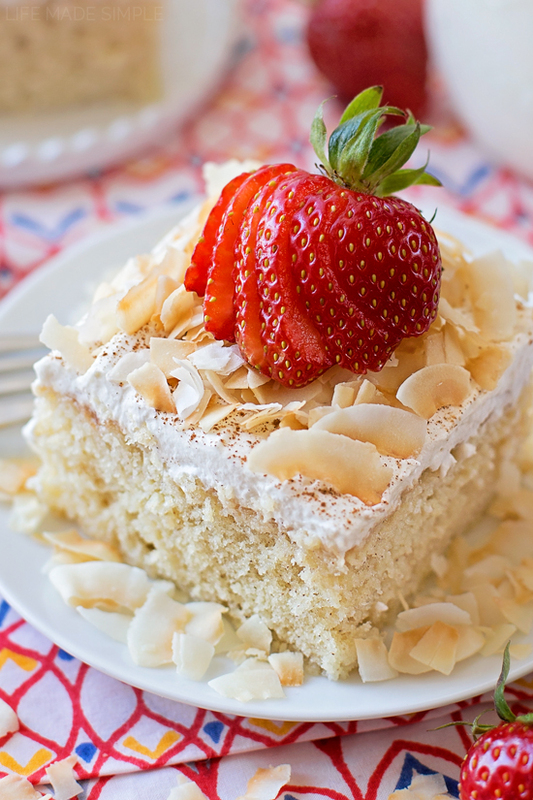 WARNING: This is NOT a traditional tres leches recipe (or a dense rubbery sponge cake). 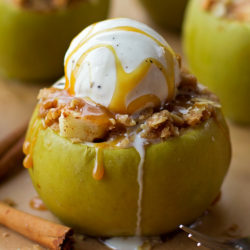 So no snarky comments on how this recipe is isn’t right, ok ????. I’m kidding, but only kind of. I know this is far from the traditional version, but that’s kind of the whole point, isn’t it? I’m sure you could google ‘tres leches’ and come up with a million of the same recipe, but I wanted to make something different, a cake that had my stamp of approval on it & one my family would really enjoy! To start you’ll want to make the cake batter. It’s pretty simple and straightforward. I used cake flour to lighten it up, along with a generous amount of cinnamon and a pinch of freshly grated nutmeg to give it a kick. You can omit those last two ingredients, but they add soooo much flavor! 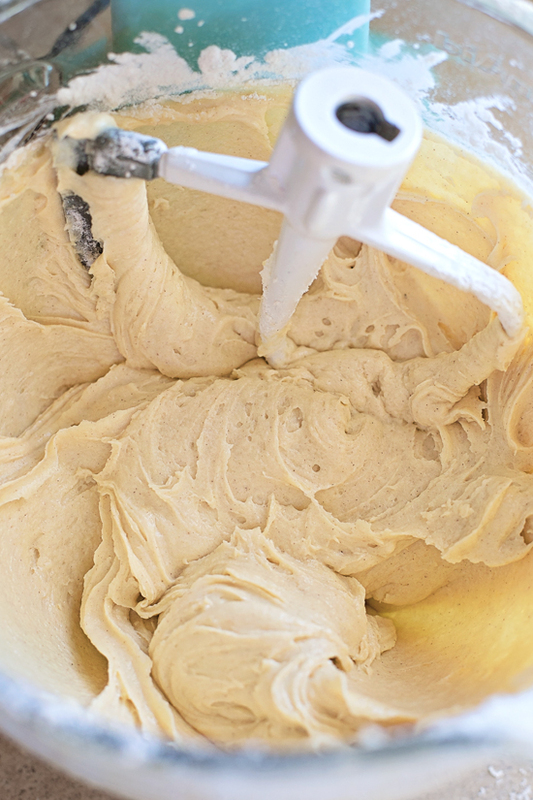 Use a stand mixer or a hand mixer to cream your butter and sugar together. Again, it’ll give the cake a much more desirable texture. When your batter is mixed up, spread it into a prepared baking pan and bake until golden brown. P.S. the batter will seem thick and like there’s not nearly enough, but it’ll rise as it bakes. 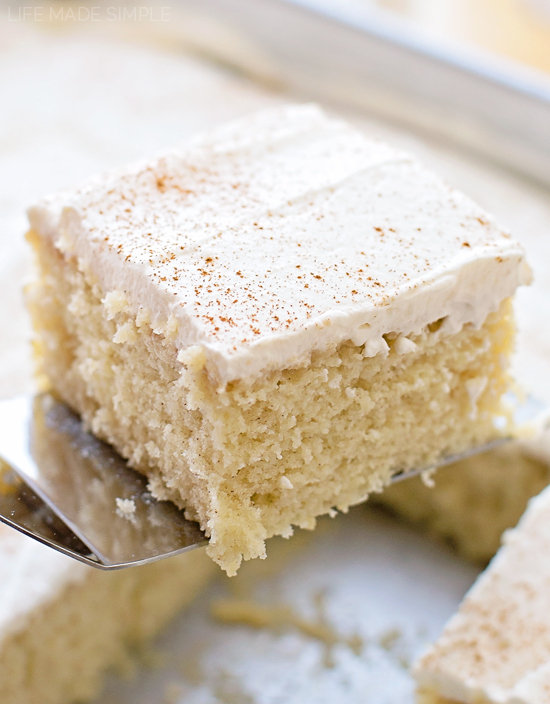 Once the cake comes out of the oven, you’ll want to mix up the tres leches! I used my 4 cup glass measuring cup to do this, which was great because it made pouring it over the cake so much easier. You could whisk it together in a medium mixing bowl too. I added a splash of vanilla just to give a touch more flavor. Use a skewer if you have one to poke lots and lots of holes all over the cake. The more, the merrier. The deeper, the better. If you don’t have a skewer you could definitely use a fork, but again, the goal is to get all of that liquid down into the cake. I go about 3/4 of the way down when I make my holes. I didn’t really see a need to let the cake completely cool before doing this, so I slowly poured the three milks over top, allowing it to absorb as much as it could as I went along. Next comes the hardest part. Wrapping it up and placing it in the refrigerator to chill. For 4+ hours!! I know, but it’s well worth the wait, I promise. The cake desperately needs time to absorb all of the liquid. I’d suggest making this the night before you want to serve it, that way the flavors melt together and the cake is nice and moist. Please note that 4 hours is the very minimum amount of time you should refrigerate it for. When you’re ready to serve the cake, remove it from the refrigerator and whip up the topping. Spread it over top and dust the cake with cinnamon. 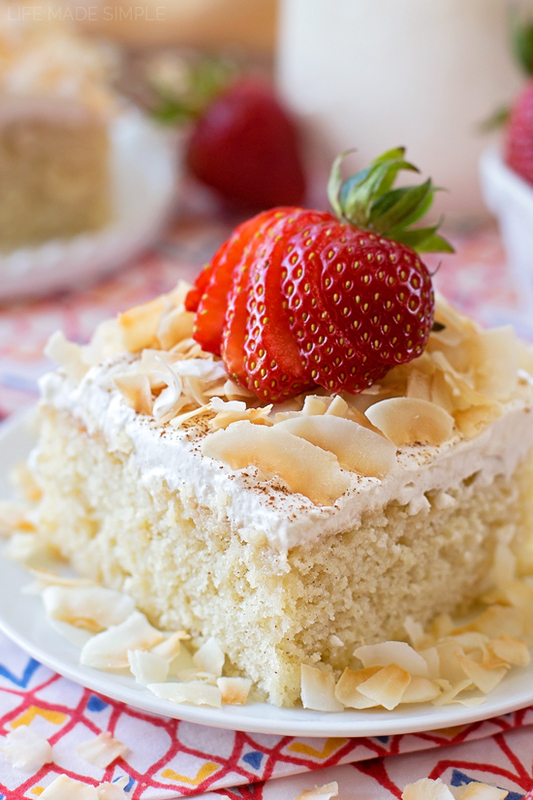 We garnished ours with toasted coconut and sliced strawberries. It took the cake from delicious to amazing! I’d highly suggest giving it a try both ways and seeing what you like best… but who doesn’t love coconut and strawberries?! This cake is definitely one we’ll be making every year on Cinco de Mayo. 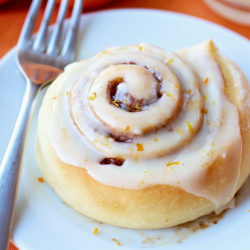 It’s sweet, moist and has the perfect little hint of cinnamon that I love. Enjoy & happy baking! You're going to fall in love this tres leches cake- I did! It's tender, moist and sweet, the perfect treat for your Cinco de Mayo fiesta!! Preheat the oven to 350 degrees. Lightly spray (or butter & flour) a 9x13-inch pan; set aside. In a medium mixing bowl, whisk together the cake flour, baking powder, cinnamon, salt, and nutmeg; set aside. In the bowl of a stand mixer (or a large mixing bowl with a hand mixer) beat the butter on medium speed until pale and fluffy, about 2 minutes. Turn mixing speed to low and add the sugar and vanilla. Scrape down the sides, then add the eggs, mixing after each addition. With mixing speed on low, gradually add the dry ingredients, mix just until combined. The batter will be thick. 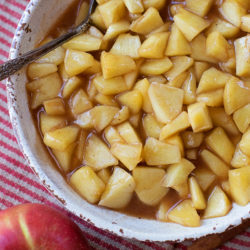 Spread the batter into the prepared pan, place in the oven and bake for 20 to 25 minutes, or until the cake is lightly golden brown and springs back when touched. NOTE: It will rise significantly during the baking process. Remove from the oven and allow to cool in the pan for 5 minutes. Meanwhile, in a large glass measuring cup or a medium bowl, whisk together the evaporated milk, sweetened condensed milk, half and half, and vanilla extract. Poke the top of the cake with a skewer or fork. 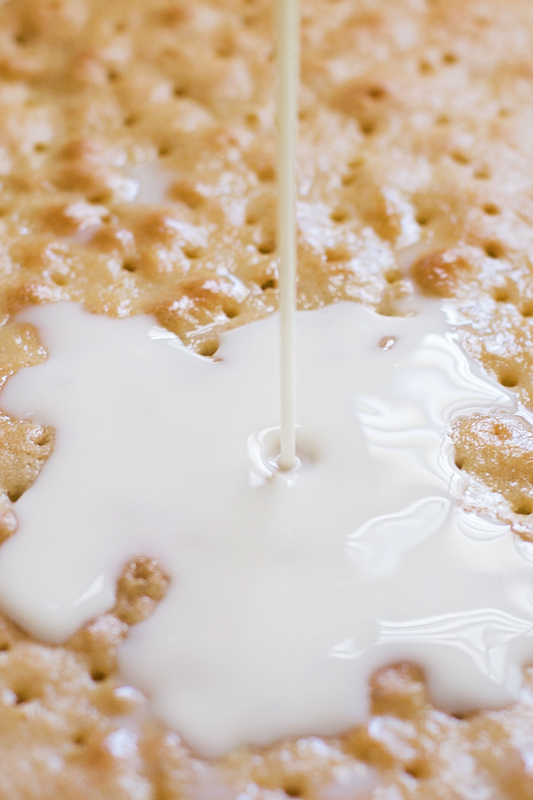 Slowly pour the glaze over the cake, allowing the liquid to be absorbed before pouring more. When cover with foil and place in the refrigerator and allow the cake to sit for at least 4 hours before serving, preferably overnight. Remove the cake from the refrigerator. In the bowl of a stand mixer or with a hand mixer, beat the heavy cream, powdered sugar and vanilla extract until stiff peaks form. Spread over the cake, then dust with cinnamon. Garnish with toasted coconut and fresh strawberries, if desired. Serve immediately or return to the refrigerator until ready to serve. -You don't have to add the cinnamon or nutmeg to the cake batter, but I think it gives this cake just a touch of added flavor! hey girl I think I have had this cake a few times! Yummy! 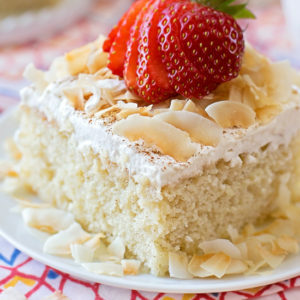 This is an amazing twist on tres leches. I will make it over and over again!